Years ago, I denounced the view that the ‘blood moons’ of 2014 and 2015 could mean that Jesus would return or that the ‘Day of the Lord’ was about to start. This was something that Mark Biltz (who practices Messianic Judaism) started promoting back in 2008–but he was wrong. Rabbi Fish verified the connection between Tu B’Shevat and the blood moon, explaining the special significance for the moon in Kabbalistic (Jewish mystical) terms. Blood moons long have been associated with significant events for the nation of Israel, and the coming event is known as a “super blood wolf moon eclipse” because it will be a total lunar eclipse for parts of North America at a time when the full moon is at the closet point of its orbit to the Earth. He continued, “Nonetheless, the lunar eclipse over North America bears a message for the U.S. and the Jews. It clearly is telling the Jews that they need to come to Israel. WND reported Pastor Mark Biltz, the man who discovered that such events historically have been accompanied by significant developments for the nation of Israel, is keeping an eye on the next lunar eclipse. He noted that the 2014 and 2015 blood moons fell on Jewish holidays. The eclipse this month, he said, “just so happens” to be on the date of President Trump’s inauguration two years ago. This next blood moon is simply a natural phenomena. Donald Trump’s birthday and inauguration date are not relevant. Actually, the quote from Joel 3:3-5 in BIN is, however, as it PROVES that the next blood moon is not of biblical significance. Because the “great and terrible day of Hashem” (otherwise known as the “day of the Lord”) cannot start for at least six years (see When Will the Great Tribulation Begin? 2019, 2020, or 2021? ). Hence next week’s super wolf blood moon is NOT related to Joel 3. Nor are the other ones expected for this year. While BIN and WND sometimes have useful information, much of their prophetic speculation has been in error. Blood moons and eclipses have come and gone. But the signs of the times are getting more ominous than ever. As if the total solar eclipse last August and the “blood moons” of 2014 and 2015 weren’t enough, there will be a “super blue blood moon eclipse” on Jan. 31 – something that hasn’t happened for 150 years. And this rare event could herald war and turbulence on earth, according to a leading researcher of astronomical signs and how they interact with Scripture. Rather than just looking skyward, Pastor Mark Biltz of El Shaddai Ministries, the man who discovered the “Blood Moons” phenomenon, says people need to be looking to their Bibles. “Many people seem to be overlooking the real importance of this event,” Biltz told WND. “The ‘super moon’ which takes place on January 31 is what is termed a ‘blue moon,’ because it is the second full moon in one month. It’s also going to be a total lunar eclipse, making it a ‘blood moon’ as well. This is the first time there’s been a total eclipse for a blue moon in 150 years, which makes it remarkable enough. Biltz, author of “God’s Day Timer,” stresses he is not saying anything will happen on Jan. 31, the date of this blood moon. However, he argues the specific dates involved show God is sending an important message. Biltz argues this message is of key importance for people alive today. He also argues the mention of the “second year of Darius” is also of critical importance, as the second year of President Trump’s administration approaches. Yet once again, Mark Biltz and WND are promoting blood moon nonsense. God is NOT sending some special message with a recurring natural phenomena. Mark Biltz and WND also promoted falsehoods related to the eclipse of August 21, 2017 (see ‘Blood moon’ Mark Biltz claims massive eclipse a sign of God and Mark Biltz on the approaching Asteroid Apophis and the August 21, 2017 solar eclipse). As far as prophecies and Donald Trump’s presidency goes, here is a link to our video which shows world events have been confirming at least 18 things I wrote about based upon my knowledge of biblical prophecies and geopolitics: Donald Trump’s Prophetic Presidency. But WND does not promote that. Both Mark Biltz and WND’s founder Joseph Farah consider themselves to be ‘Messianic Jews.’ While this means that they will avoid biblically unclean meats, keep the Sabbath, observe the biblical holy days, and hold to parts of a few Church of God doctrines, the Messianics are NOT Church of God Christians (see also Messianic Judaism Beliefs Differ from the Continuing Church of God). Like the Seventh-day Adventists, the Messianics are basically a type of Protestant. WND promotes him, but Mark Biltz has repeatedly been wrong. He misled many about the “blood moons” (see also WND continues to promote Mark Biltz’ blood moon nonsense) and about the 2017 solar eclipse supposedly being a sign from God. Mark Biltz is once again trying to tell people to be in awe of something that does not have prophetic significance. Do not be like the pagans and read things into astronomical phenomena that people like Mark Biltz are pushing. How he twists scriptures (cf. 2 Peter 3:16) and connects things while overlooking what the Bible teaches reminds me a lot of the late Harold Camping, whose detailed calculations and predictions were later proven wrong (see Harold Camping’s Teachings About the End of the World Do Not Agree with the Bible). So, before the ‘super blood moon” occurs, I again want to inform people that this eclipse is a natural phenomenon and not anything that is a direct message from God like Mark Biltz implies. Nor is it a sign from God that Jews are to return to Israel. Because there are many false and heretical leaders that lead people astray on prophecy and sometimes they mention the Bible to try to act like God sanctions their nonsense, they should be denounced as false. All should REALLY pay attention to the Bible. Thus, you can be certain that the upcoming ‘super blood moon’ is not a message from God. Blood Moons, Eclipses, and Prophecy There were four ‘blood moons’ expected in 2014 and 2015. Some claimed that they signaled the Day of the Lord or the return of Jesus Christ. I denounced that view in advance. Some later pointed to a solar eclipse in 2017–is that a ‘sign from God’? What about the ‘Super Blood Moon’ of 2019? A YouTube video is also available: Blood Moons, Prophecy, 2014, and 2015. Wormwood and Planet Nibiru Will the Earth be devastated by Planet X or Comet Encke? What about Planet Nine? Here is a link to a related YouTube video Could Comet ISON be Wormwood of Bible Prophecy? 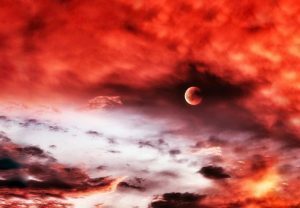 Planet Nibiru to Destroy Earth by 2017? Some say NASA has identified Plant X, also called Planet Nine or Nibiru or even Planet 7X. One prophecy watcher has stated that this planet will destroy Planet Earth by January 1, 2017. Is this possible? While the Bible tells of a destructive power called ‘Wormwood’ will come from outer space to destroy much of the Earth in Revelation 8, can Wormwood hit by 2017? Dr. Thiel explains from the Bible why Wormwood could be a comet and why the Bible and not those who misinterpret it should be trusted. This is a video. Harold Camping’s Teachings About the End of the World Do Not Agree with the Bible Harold Camping taught that the rapture will be on May 21, 2011 and the world would end on October 21, 2011. What does the Bible show? The Dangerous Rise of Preterists Has the Great Tribulation finished? What was the view of early Christians? Why is the preterist view dangerous? Zephaniah’s ‘Gather Together’ Prophecy Is it safe to be ‘independent’ or in a non-Philadelphin Church of God? What did God inspire Zephaniah to write? Messianic Judaism Beliefs Differ from the Continuing Church of God Both groups keep the seventh-day Sabbath, but have important differences in doctrines and practices. Here is a link to a related sermon: Messianic Jewish Beliefs. This entry was posted on Tuesday, January 15th, 2019 at 8:00 am	and is filed under Prophecy, Religious News. Super Blood Moon expected next month: Are prophetic concerns justified? ‘Blood Moon’ rapture or Daniel 9:27 next month? Could next week’s ‘blood moon’ be a message from God? Does the ‘blood moon’ predict the ‘Day of the Lord’ in 2014?